Mixing a normal field of view with perspective- and depth of field control, the TS-E 45mm f/2.8 from Canon is a tilt-shift lens well-suited to producing well-corrected imagery with a natural perspective. Up to +/- 8° of tilt is possible, for focus control, and +/- 11mm of shift, to adjust perspective and composition. The tilt-shift mechanism can be rotated +/- 90° for applying movements in any direction, and a tilt-locking mechanism can be used while shooting for greater stability. The lens also employs a floating optical system and rear focusing design to maintain image quality throughout the focusing range and a Super Spectra coating has been applied to individual element to reduce flare and ghosting for increased contrast and color accuracy. Perspective control, tilt-shift lens affords +/- 11mm of shift and +/- 8° of tilt, and both types of movements can be applied independently, and parallel or perpendicular to one another. Additionally, the tilt and shift functions can be rotated +/- 90° for applying the movements in distinct directions. Tilt-locking mechanism ensures the lens stays in place while shooting. Floating optical system and rear focusing design maintain clarity and image quality throughout the focusing range, from 1.3' to infinity. 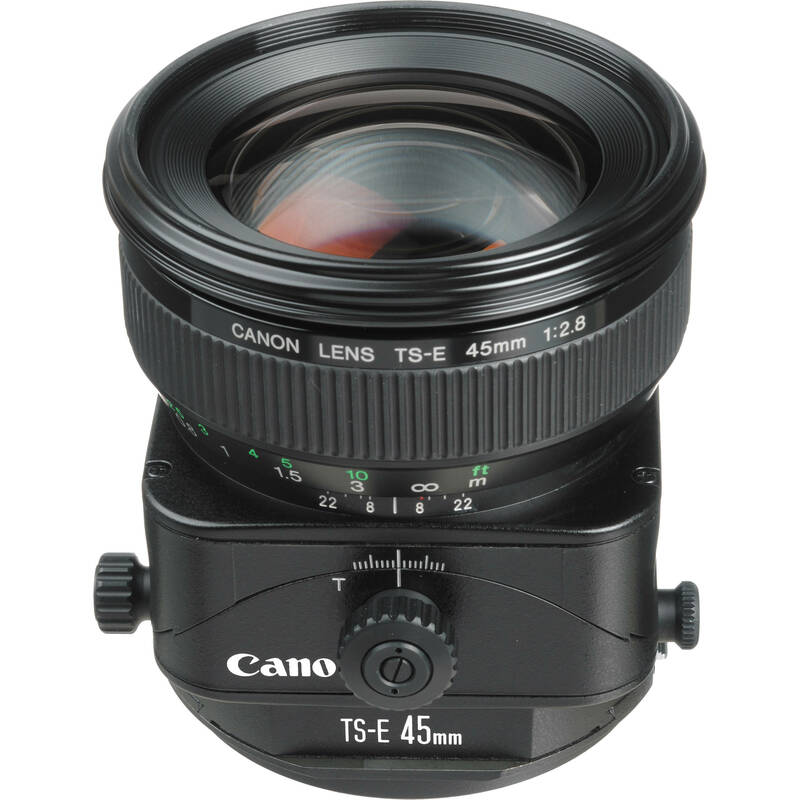 TS-E 45mm f/2.8 Tilt-Shift Lens is rated 4.6 out of 5 by 82. Rated 2 out of 5 by GG Archard from Useful, but poor glass I shoot architecture, so TS is useful for me. I have the whole range of Canon ts lenses and this is by far the poorest offering. The tack sharp reviews on here are wide of the mark. It is distinctly soft, has quite severe barrel distortion which is difficult to correct once you've shifted, and suffers from very bad chromatic aberration. The movement is useful, but pretty small. Desperately in need of an update with more movement, and locking nobs (like the updated 24mm) so you dont accidentally get a smidge of unwanted swing. Given the small amount of movement, you may as well get a Sigma 50mm which is a million miles better in terms of image quality and do a bit of keystoning in post. Rated 5 out of 5 by DFW Creative Director from Great Depth of Field I purchased this lens to shoot product photography. My client is an eyewear retailer who has some very detailed frames. Since these can be quite deep from front to back I needed a lens that would give me a wide depth of field as well as prevent any aberration or distortion in its representation of the product. The lens delivered. The detail and color that are rendered by the lens is incredible. The DOF is deep enough to get the front of the frames to the back of the temples and the detail is tack sharp. A great purchase, well worth the $$$$. Rated 5 out of 5 by amfoto1 from Go places with this lens that few others dare! I bought the 45mm TS-E lens for one use and ended up using it most of the time for completely different purposes. WIth film cameras, I mostly used it as an urban landscape or architectural lens. But now with 1.6X crop sensor digital cameras I find it an excellent macro or near macro lens! The shift and tilt capabilities are a real bonus, to give even greater control over the plane of focus. It's become my main "table top" small product lens. I also use the 24mm TS-E. Now that lens is more of an architectural lens for me. If I were shooting with full frame digital cameras, I'd want the 90mm, too, for macro and near macro work. These lenses are extremely well made. They are manual focus only, but that's not an issue for the types of shooting their designed to do. Besides, every EOS camera I've ever used TS-E lenses on gives a focus confirmation, making it easy to use the lenses manually. The only thing I'd like to see done differently if the TS-E lenses were ever revised would be to build in another rotation, that allows the user to set the tilt and shift planes ligned with each other, or set 90 degrees out of phase. As it is now, the lens comes with the two adjustments at 90 degrees, but you can send them in to Canon Service Department to have them aligned, if you wish. Build quality and the "feel" of all three TS-E lenses are the same, excellent, although only the 24mm gets an L designation. The TS-E lenses are about as close as you will come to view camera movements on a full frame or crop sensor digital camera. A full featured 4x5, for example, will have more types of movements possible, as well as a bit more range of movement. Still, it's a lot more practical to use the TS-E lenses and EOS cameras out in the field! If you've used a view camera in the past, these lenses will be easy to use. If not, there will be a bit of a learning curve using them. Read the manual and, if still scratching your head, pick up a book on using view cameras. Rated 5 out of 5 by Anonymous from Great Lens While I am not a great photographer, this lens is excellent for its manipulative DoF. At a 45mm focal length it allows for a slightly larger angle of view, further increasing its versatility (in my opinion), over its 90mm, 24mm and 17mm counterparts. However, I will admit that it does have a bit of a learning curve to it. While not being to complicated, you probably won't be able to maximize its potential (with, for instance, the tilt function) without doing a small amount of reading first. Although, this lens has quickly became one of my most valued lenses. I would strongly recommend this lens to anyone with the desire to try something new and the patience to see it through. Rated 4 out of 5 by Commercial Photog Ashley from Excellent for correcting perpectives Great for table-top product photography and architectural photography. Shift the lens to correct converging vertical perspective lines. Tilt the lens to control depth-of-field. Easy to use if you read about how it works first. Must use a tripod, and not good for moving subjects or action shots because the adjustments are pretty fine. Lens has bad chromatic aberration (color fringe) in the red channel when shifted to it maximum setting, but it can be lessened in Photoshop with a few steps. Rated 3 out of 5 by cb_photo from Needs improvement I've owned a 45mm TS-E for 7 years and find it fun and an enjoyable experience to use. However, it needs improvement in several areas. It needs a circular aperture, rotatable tilting, and Canon's SSC lens coating. With these improvements the lens will be world-class. Focus across the image plane is adequate but could be sharper. At large apertures there is significant color fringing. An updated version of this lens would be welcome. Rated 5 out of 5 by Christiana H. from Something completely different This lens is impeccably made and allows you to experiment with photography in a way few other lenses can. Between the depth of field options, tilt, and shift, there is so much you can do with this lens. It takes work learning how the different settings work (separately + together) but it's definitely worth your time. Also, it's manual focus, so practice before you use it on a big job. Definitely worth the money and so much fun to use! Works with a variety of cameras. I shoot with a 40D currently but if I consider upgrading to a mark, I can use the lens with that model as well. Rated 5 out of 5 by iwantapuppy from My new all purpose lens! This lens made me fall in love with photography! The lens is sharp and fast, and the effects you can get with the tilt and/or shift are endless. Using the tilt and shift to precisely control the plane of focus is helpful when shooting products or still-life photos. Twisting it the other way gives beautiful soft effects, allowing precise emphasis on fine details. And then there's always the sheer silly fun of making real-life look like miniature models. The lens itself is solid and the tilt and shift quickly become second nature to use. I've added a Canon 2X extender, and the photos are wonderful. I can get the shots I want without spending as much time editing pictures in the computer later. The greatest benefit to me is the lens forces me to think about the scene - what I want to capture, what I don't want. My husband loves the lens for specific shots, but he is more of an action/zoom/nature photographer, and so this does not work as well for him. Which means I don't have to go looking for it! Win-win. Is this a manual Focus lens or is there electronics on the lens forbautofocus? 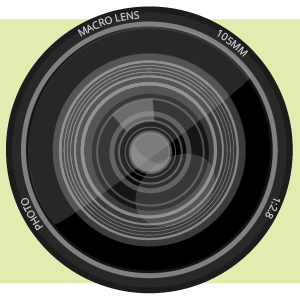 While there are electronics in the lens for metering in a Canon EOS DSLR, it is a manual focus lens. I was wondering if anyone has any experience using this this lens with the Canon Extension Tube EF 12 II. Does it affect tilt/shift function? Basically, I am looking for some macro functionality with tilt/shift. Thanks. You can use the 45mm Tilt and Shift lens with the extension tubes but you will lose some tilt and shift functionality.